1. Spend the time upfront to produce the best quality you can provide. 3. Use your merch to provide something consistent relevant and new to your loyal fans. 10. Get all the sizes. 11. Give only the right stuff away for free. “You can’t judge a book by it’s cover”. As someone who loves design this old adage drives me crazy. If the book is good, why not make a great cover for it? When it comes to band merch if the quality is poor, what does this say about your band? If the album cover looks poorly produced, what does the recording sound like? Fair or not people will judge you on how your band appears as much as the way you sound. What does the black flag logo look like? What does Metallicas Logo look like? Make a logo. Use it. Use it for everything. Distribute it to the venues and promoters anyone one that would put your band on a flyer. Make a rubber stamp and have the door person mark peoples hands with your band’s name. A few years back I played with a band called Suedehead. They had very well branded merch. 3 EPs that all were similar style. At their booth with a matching poster, tshirt, patch, sticker. This did not happen by accident, it was planned. What is your secret sauce? Keep your merch fresh and relevant. Try selling the concert poster for each show at the merch booth. What if you had pins for every show that your loyal fans could collect? These are just a few ideas to get you started, it is up to you to Come up with something unique that fits your fan base. Don’t ever tour through the same city with the same old stuff you had last year. Produce low quantities so you may turn your merch over quickly and have new items to highlight the constant moving force that is your band. Have a mailing list signup, use it. Collect email addresses for each city you play in. Send out emails before the show announcing where you are playing. Email marketing is a very effective way to reach your fans. Keep your marketing efforts focused and interesting. Congratulations your merch setup is now part of the band gear. It comes with you to every show, just like that snare drum or guitar. 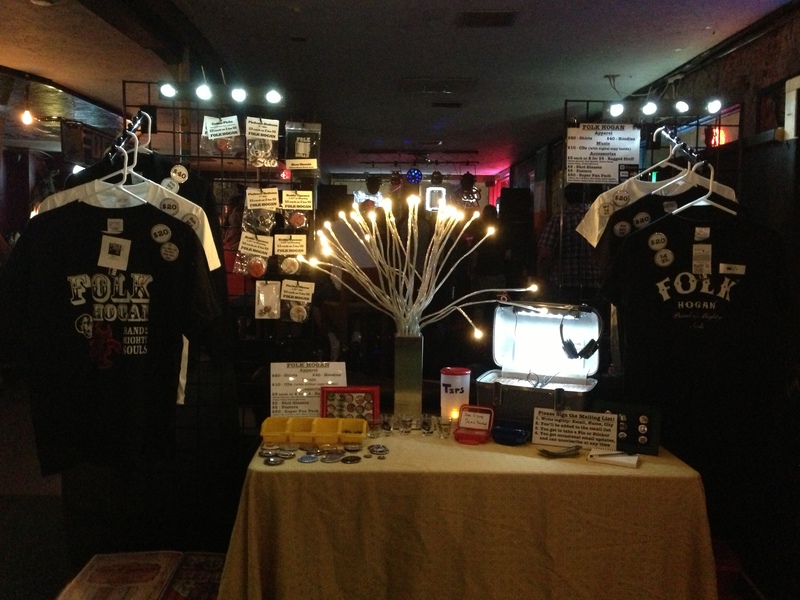 Have your own table and/or rack system to facilitate your merch. Have good lighting. In general people are attracted to lights, that is why every bar you go to has them. I suggest using LEDs, a Lamp, and some Xmas Lights. Ensure that people can actually see your swag in the dim venues you play. Set up the merch immediately when you get to a Venue and take it down last. Set it up in a high traffic and noticeable area. Near the door, bathrooms, or comfortably near the stage are often good spots. I’ve had times where the bar staff has purchased more merch than the crowd prior to the show. I’ve witnessed many times where someone would buy merch prior to the band playing or after they got there credit card back after settling up with the bar. Who wants to lug a T-Shirt around all night with them anyways? Many people will plan on grabbing something on the way out, don’t let them forget. Have stuff for free, $5, $10, $20, $50, $100. Hit every price point. Is anyone going to buy $100 worth of stuff from you? Probably not. But their brain has just gone through the same process that yours did when they saw those prices. “$100 that’s to much money for me to spend. I wan’t to support the band so I’m not a free or a $5 but more of a $20.” They just up-sold themselves. That brings of to the next point. A. $5 Crappy Fan pack. You want to support the band, but its easier to go download the music illegally. B. $25 Good Fan pack. 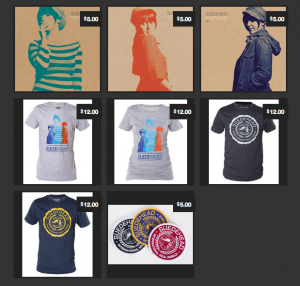 You want to support the band, and will sport the T-Shirt and rock the album. C. $50 Obsessed fan pack. You want to supper the band, and your going to get everything they sell. Maybe you’ll buy two so you can keep one next to the hair sample you took from the singer for your shrine. Its cool though, its not like a creepy shrine, man we shouldn’t have put our cell phone numbers on Facebook. Have a price list. Label the individual items. I have used a laminated price list and pin back buttons on each T-shirt. Don’t make your more introverted fans ask, because they may actually decide its easier to not buy something then risk feeling stupid. Your more Extraverted fans will ask anyways, they honestly didn’t see the 3 labels you had, and that’s ok too. 10. Get all the sizes of T-Shirts. Here in ‘Merica we pride our morbid obesity, so please, carry all the sizes. Carry them so when I’m rolling in my jazzy aka freedom rider, I can rep your band. But seriously get all the sizes of shirts, get the big ones, get the small ones, get some ladies shirts. You want all the ladies to wear your shirts right? It doesn’t mean you need a million of the less frequently selling sizes, it just means that not everyone is a skinny bass player that still shops in the children’s section of PJs. Merch is your bread and butter. Give away free stickers for signing the mailing list, and maybe pins, but not the hoodies that cost you $27 each to produce. Rant: I don’t believe in giving away free T-Shirts ever, I just don’t. The reason is the margin is to slim, and it kills the profitability. Even when my band mates want a shirt they pay for it. They pay the $10 or $8 it cost to make it. That way even though the band isn’t turning the profit, they are not killing us either. I encourage this, and open each new merch order up to the bandmates to get them for themselves and there mates. On the flip side if someone let us stay at their house on tour I’m happy to provide them with a poster signed by the band, a CD or something unique. I just don’t personally like giving away T-Shirts. I hope my thoughts have been interesting or helpful! What has worked for your bands in the past? Hit me up. Don’t have shirts yet? No problem! I can help you with that. Simply fill out the form below.